Final Fantasy XV finally hits the shelves, being announced a decade ago and having to be delayed over and over again. Final Fantasy gives us a new story, new gameplay mechanics, and new characters. Does this game triumph or does it suffer the Duke Nukem effect? Let’s find out. Story: You play as prince Noctis as he is about to embark on a life-changing journey/adventure with his friend, Ignis (cook), Prompto (best friend), and Gladiolus (bodyguard). You begin by leaving your kingdom to go get married to Lady Luna Freya, to make an alliance between his kingdom and hers. Early on in his journey Prince Noctis and his friends come to discover that the imperial army has taken over his kingdom, his father has been killed, and his bride to be is missing. So now it is up to him and his loyal companions to take down the imperial army and reclaim their kingdom. Gameplay: Final Fantasy XV is a bit different than what some classic fans are used to, being familiar with the linear turn based RPG; that is not the case here. 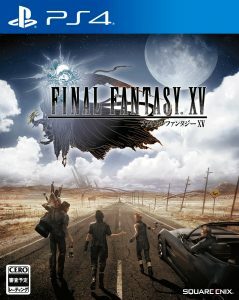 Final Fantasy XV is a game that combines both linear and open-world gaming; the first half of the game is open world with lots of side content, and the second half is completely linear. The combat is totally different and much more in depth than expected; this includes some timely countering, dodging and combining combos with your party. You can assign your party special attacks; along your adventure you can upgrade their abilities, and their natural abilities such as cooking, fishing, and photography. Another big part of this game is the traveling, you have a special car that takes you place to place which is mostly driven by Ignis, but when you choose to drive the controls are so stiff with the car you are better off fast traveling or just having Ignis drive the whole time. The bond between the four friends is quite remarkable and you see how it becomes stronger as the story progresses. When you’re not out in the field taking some monster down for some extra XP or driving to the next check point you are exploring dungeons, eating food, and collecting resources. Graphics: Final Fantasy XV does not disappoint when it comes to the graphics, improving from its predecessors and living up to the expectations of a next-gen game. Final Fantasy has always pushed the limits regarding its visuals, and XV does just that. Verdict: Final Fantasy XV delivers; for a game that did not have my interest, once I had it in my hands I could not put it down. With a fantastic story, unique characters, in depth combat, wonderful RPG elements, and a ton of weaponry to choose from, Final Fantasy XV is a game you do not want to skip out on this holiday season.